Make your life easier with this special sippy by Eco Vessel that keeps drinks fresh and cold for hours, while keeping hands warm and dry. It comes with a NUK silicone spout that has a nice snug fit, so no messy leaking. Just push the spout through the ring, fill with water, milk or juice, screw the top on the bottle and it's ready to go. Make your life easier with this special sippy by Eco Vessel that keeps drinks fresh and cold for hours, while keeping hands warm and dry. 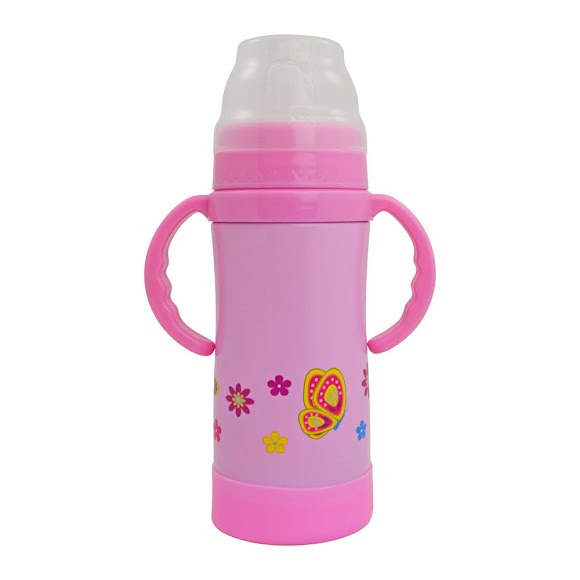 It comes with a NUK silicone spout that has a nice snug fit, so no messy leaking. Just push the spout through the ring, fill with water, milk or juice, screw the top on the bottle and it&apos;s ready to go. This growler features our vacuum TriMax triple insulation technology and has been tested to keep liquids cold for 36 hours and hot up to 8 hours. Its dual use leak proof top has a wide opening for easy filling and a small opening for easy drinking. A versatile vessel for anything, anytime, anyplace and now available with interchangeable tops!